This past Friday, I had the privilege of leading a group of 50 Catholic pilgrims on a historical tour of Philadelphia. They are in town, of course, for the visit of Pope Francis. Philly history tours typically include visits to the Liberty Bell, Independence Hall, and other sacred national sites related to the national founding period. However, knowing the reason that these tourists were in town, I decided to take a risk and head off the beaten path. While the holy hoards of tourists headed south from our meeting place at the National Constitution Center through the grassy expanse of the National Mall, I paused for a moment to ask the crowd if they knew what two things the U.S. Constitution says about religion. One woman shouted, “One Nation Under God!” and another said “the Government should support religion!” However, most of them seemed to know that it said something about preventing the government from endorsing one religion (Congress shall make no law establishing a religion…) and guaranteeing religious freedom for all (…or prohibit the free exercise thereof). As I steered the group eastward away from the crowds, I began to tell the story of the important role that Philadelphia’s religious history played in the constitutional debates about the proper relationship between religion and state. During the seventeenth and eighteenth centuries, most American colonies had established religions. For instance, if you lived in Massachusetts, Puritans were in control. Religious non-conformists were either exiled or put to death. Stopping in front of the Arch Street Friends Meeting House, I told the group that the Pennsylvania colony was different. William Penn, a Quaker, knew firsthand what it felt like to be persecuted for one’s beliefs. Due to his divergence from Anglican orthodoxy, Penn was imprisoned like scores of other Quakers in the late 1600s. When his father Admiral Penn granted William a massive tract of land in North America, Penn chose not to impose Quakerism as the official religion of the colony. Instead, his 1701 Charter of Privileges guaranteed religious freedom for all. Early on, Philadelphia became a haven for Mennonites, Pietists, Lutherans, and also for Jews and Catholics as well. 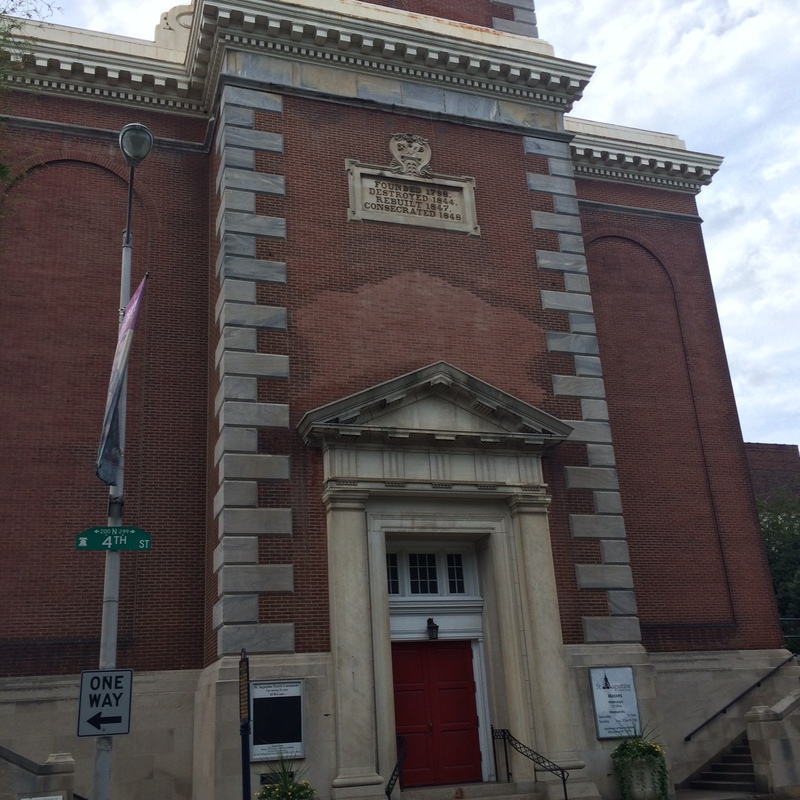 As we walked past Mikveh Israel, the second oldest synagogue in North America, I told the story of Philadelphia’s first Jews who established a cemetery and synagogue in the 1740s. Although the distance was too far to walk, I pointed them towards Old St. Joseph’s, Philadelphia’s first Catholic Church founded in 1733. At the time, Philly was the only place in British North America where it was legal to conduct a public mass. Time was running short on the tour so we took a quick walk past Christ Church and Elfreth’s Alley on our way northward to the corner of 4th and New Streets. In the shadow of the Benjamin Franklin Bridge stand two prominent churches: St. Augustine’s Catholic Church and Old St. George’s United Methodist Church. At this intersection, I told the Catholic pilgrims a story illustrating the limits of religious toleration in the city that Penn founded. In 1844 Nativist rioters burned down St. Augustine’s Church, its rectory, and a library containing thousands of books. During that summer, churches were burned in other parts of the city, 25 persons were killed, and hundreds were injured. I told the group that the civil authorities put an end to the rioting with the use of military force, but few Protestant Christians intervened to stop the violence before it began. For instance, in the Methodist church archives across the street, there is no mention of the burning of St. Augustine’s Church. Perhaps Old St. George’s members were among the Nativist rioters? 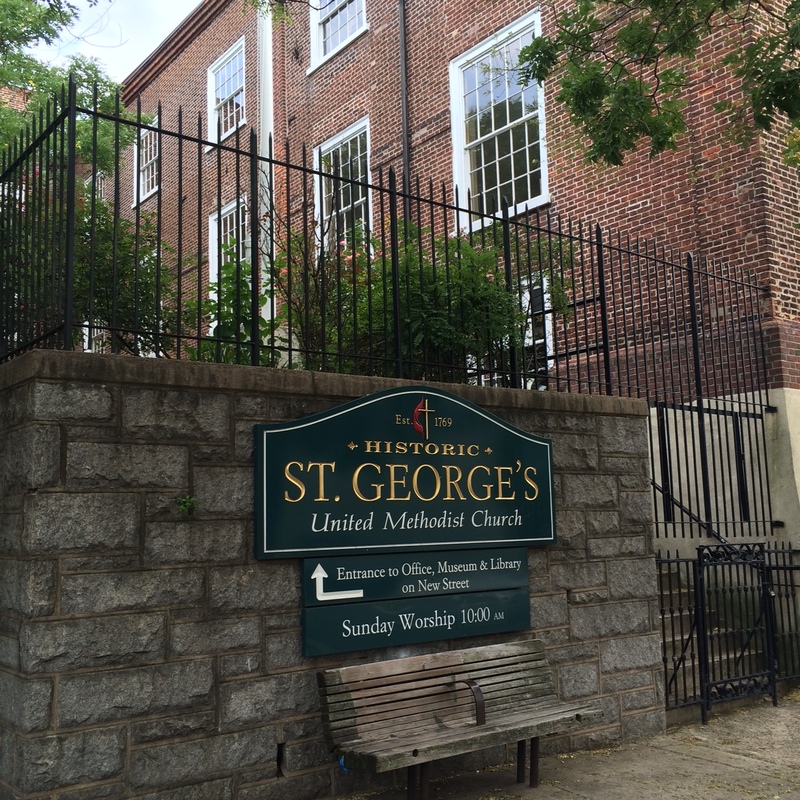 We can’t know for sure, but this possibility grieves the current members of Old St. George’s. As a Methodist myself, it grieves me also. I challenged the group to think about what groups in our society are viewed as un-American or threatening in some way to the status quo. Half-jokingly, I offered an apology to my new Catholic friends on behalf of the Protestants who started the riots and also those who watched the events and did nothing to intervene. They warmly received my awkward attempt at trying to make them feel welcome. If William Penn were alive in 1844, I suspect he would have been saddened by the way that the Catholic newcomers were treated. In 2015, Penn’s legacy in Philadelphia continues to inspire and even Pope Francis acknowledged it in Saturday’s speech in front of Independence Hall. May the pontiff’s words about religious liberty inspire Americans to extend hospitality to all groups that are unfairly marginalized in both church and society. Bio: David M. Krueger is an independent scholar of American religious history, a deacon serving at Arch Street United Methodist, and he also offers historical tours in Philadelphia. He has a PhD in religion from Temple University and is the author of the new book, Myths of the Rune Stone: Viking Martyrs and the Birthplace of America. Also, be sure to watch the new documentary film on the Catholic history of Philadelphia. Visit http://urbantrinityfilm.com/.